← What’s the most screwed up media business? 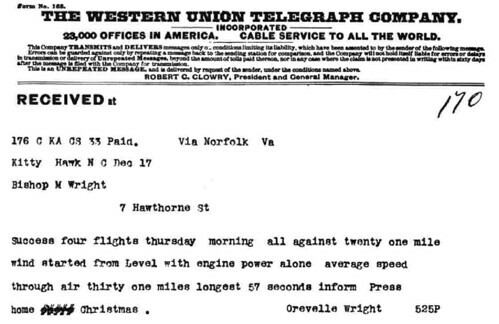 I was at the Wright Brothers National Memorial a few weeks ago and struck by the telegram that Orville Wright sent to his father announcing the success of the first machine powered human flights. The message was kept short, probably to keep down costs. It was likely dictated to a telegraph operator, hence Orville’s name is misspelled on the document marking the important occassion. With all of our new ways of communicating, we’re constantly evolving the language. And despite communication being virtually free — there’s pretty much no additional cost for sending a longer email or chatting with your friends on the phone — the language has gotten more concise. We write as little as is takes to get the message across. The difficulty of text entry on cell phones is one of the culprits. Short cuts like “r u there?” and “k” save us valuable thumbstrokes. This shorthand has made its way to IM and email. Even T9, the predictive text entry system on many phones, is a factor. I received a message from a friend saying “Going to beans morgan for a bday party you are more than welcome to john if you want” I knew she meant adams morgan and join. She just kept typing and used the first word T9 guessed. I’m also resorting to picture messaging more to make sending messages even easier. What would the Wright Brothers message look like today? It’d probably be something like: “success 4 flights thu am against 21 mile wind from level w engine power alone. avg spd in air 31 miles. longest 57 secs. tell press. o” Of course there’d be a link to a YouTube video. And Engadget would be liveblogging the whole thing. This entry was posted in email, fun, im, instant messaging, random. Bookmark the permalink.